Whew, just the title is enough to give you conniption fits! The goal is to create Objective C compiler, GNUstep, and use ARC (automatic reference counting) and blocks (those cool un-threads). My first misstep was using the instructions here – which aren’t bad, but when you try to get things working in an IDE (I use Codelite just because it seems to be pretty stable, multipurpose, and lets me modify things), things go SERIOUSLY wonky. Part of it, I think, is that Linux tries to use gobjc which is seriously not right. So, like a good programmer, I burned things to the ground and started over. Instead I used the instructions GNUstep_under_Ubuntu_Linux as my starting point and built a series of scripts, rather than do everything in one, big blow. It’s a lot, so please be patient. NOTE: These instructions will NOT work for Ubuntu 12.04.1 because the compiler is too old. My eventual goal is to build a “more Linux” like application with Objective C. This means that (eventually) I wanted dynamic libraries that were “Linux-like” and an application that is “Linux-like”. The idea that an application is a directory works on the Mac, but that is not Linux. Nor is Windows Linux. Attempting to cram a paradigm in a system that refuses to accept it does not make you clever – it just makes it unacceptable by mainstream users. And while GNUstep make is designed to create .app directories, it is, to be honest, not terribly helpful where I want to take this. CMake is a nice, rugged, dependable package that has been used for some time. No, it is not a GNUstep package, but neither is Linux. Adapt to the platform, don’t argue that you are right and everyone else is wrong. Lastly, GCC is an old, creaky, hard to maintain compiler. LLVM/Clang is an awesome compiler that appears to be both modern and extendable. I see no reason to continue with outdated technology – we don’t do that with hardware, why persist with software? That is where Objective-C on Linux stands today. I initially started with a clean install of Kubuntu 12.04.03 LTS and updated all the packages that need to be updated. Finding documentation on building GNUstep is an exercise in frustration – worse some flags work and some do not. I’ll tell you how I built it and got it to work. Because I want to make sure where things fail, I broke things up into a lot of scripts. This helped a lot in debugging things. I also used VMWare to checkmark everything. I also ran under VMWare – this allowed me to back up and retest all my scripts. Okay, to get things rolling we will need PROBABLY the following packages. I say probably because I didn’t spend time trying to weed out which ones were actually used and which ones were not. If this makes you unhappy, feel free to figure out which ones are not used. Next we download CMake. We can’t use the one that Ubuntu 12.04 uses because it is too old. In this case it doesn’t hurt to use the latest and greatest (at this time). Personally, I really like CMake on Linux and I mostly like it on Windows (that is a whole different story for a different blog). You either like it or you hate it – rarely do I find anyone who is indifferent about it. However, in this case, we need it to build clang. Next we begin our serious downloads. Many of these are very large and will take some time. Note that we are not using a specific revision, but the trunk build for pretty much everything. Part of where I went wrong was attempting to use specific versions – which may work but doesn’t give you the patches and fixes that occur over the years. The last two (gscoredata and sqlclient) you probably don’t need and I won’t show how they are built. I need to use a database and plan to use Coredata to do so. Finally, once we have everything downloaded, we can begin our builds. The first item is CMake. Once this is complete, you should be able to type cmake –version at the point and get the version of cmake. With CMake built we can move on to clang. Clang is possibly my favorite build because there are no errors and no warnings – it is very professional feeling code. At this point you MAY have to create a new terminal session for everything to work correctly. If things later on complain about not finding clang, that typically seems to work for me. What is probably the most annoying part is that even though you see it referred to as “libobjc2” what gets built is, in fact, a library called libobjc and libobjcxx. The ONLY way to tell the difference (according to some) is that the eventual file is libobjc.so.4.6. If you look in /usr/local/lib you SHOULD see libobjc.so and libobjcxx.so. This is one of the steps that tripped me up and tripped me up bad. Once I got it in the scripts, everything started working better. I’m sure this makes more sense to someone else than it does me. To me make should not have any bearing on the code that is generated. But apparently someone else sees it differently. Some people recommended against building libdispatch – which to me seemed funny considering that some of these very same people argued for the custom building of clang. Color me puzzled. ./configure CFLAGS="-I/usr/include/kqueue" LDFLAGS="-lkqueue \ -lpthread_workqueue -pthread -lm"
Note that I run ldconfig. This may or may not be necessary – at one point I got frantic and just threw them in at random (I was very frustrated). At best it helps, at worst it does nothing – but doesn’t hurt. This was, by far, one of the most frustrating pieces of code to build. I had multiple configurations (one of which seemed logical) but in the end only one seemed to work. If you can figure out what I did wrong, please tell me! At this point it is very important to open another shell to continue – if you don’t GNUstep make will whine, cry, and ask you “are we there yet?” every 10 seconds. Did you open a new shell like I asked you to? Okay, but don’t come crying to me when it barfs up all over the couch like a cat. You have probably thought “hum… I may have to go and edit ~/.bashrc and clean it up (yes, you probably will). Building the base is… an exercise in weirdness. You must pass one item to the configure, –disable-mixedabi which, to be fair, is clear as mud. Reading the configure help and you get the following “helpful” information: “Disables the combined use of fragile and non fragile ABI so that base can be built taking full advantage of the nonfragile ABI” – because keeping track of retain/release etc. was SO much easier. Ugh. Sometimes we need to drag the community kicking and screaming into the 21st century. When I look at development my goal is to use “best available tools”. For Objective C that is ARC and clang. This is the easiest step to build (right or wrong). The only time I had it fail was when I forgot to start a new shell after step 9 (you did start a new shell, right?). After all the funky parameters, the GUI is pretty straightforward. Configure-make-install. Almost like it was a normal Linux program. Again, I don’t know if I don’t need the ldconfig or not. 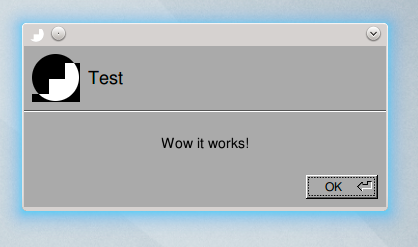 This is what makes the gui work. If you don’t know what this is, go to GNUstep and read the documentation. What I have discovered is that if this DOESN’T build, it’s because a) you forgot to start a new shell after step 9 or b) you did the steps out of order or c) something is missing (shrugs). If it DOES build correctly it doesn’t mean you have a working system – if you forgot a parameter you could have built something that will puke because the ABI doesn’t match. Step 13: Does it Work? As I have tried to indicate, just because all the steps went well doesn’t mean you have a working system. You could have some files from GCC (which implements Objective C that is incompatible with what we are building here… of course… because who wants a functioning system?) or you may have missed a configuration step. What it boils down to is that the only way to tell is to compile, link and run the thing. Here is some code that Tobias Lensing wrote that is a nice test of blocks. Note that you HAVE to comment out dispatch_release(queue); for this to compile under ARC. // Created by Tobias Lensing on 2/22/13. // More cool stuff available at blog.tlensing.org. 2013-02-24 01:08:20.981 main 21 Hello, world from a dispatch queue! The following are scripts that I used to create a working Objective C with GNUstep and ARC. Feel free to use them. I’m currently using the Codelite IDE to write with. For the most part it is well done except for environment variables – it doesn’t appear to use the ones in the shell. In order to get it to link I had to add –L/usr/GNUstep/Local/Library/Libraries so it would pick up the libgnustep-base and the libgnustep-gui. Eventually the goal is to reduce the runtime so that bundles rather than being directories (or worse, directories of directories) appear to the user as dynamic libraries. However, for the moment, we will stop here. Hi thanks for this information. I just got a problem on step 5 with cmake .. an Error comes host GCC version must be at least 4.7! after that I installed the latest version 4.8. After this I still getting the same error. Do you mean step 4 (CMake) or step 5 (clang)? I’m using GCC version 4.6.3. Okay, I’ve made the assumption you are using Ubuntu 12.04.3… my apologies. You are correct that 12.04.1 has the older compiler. These instructions will work for 12.04.3, however, I have not tested them on earlier versions. This article was very helpful. I got all of this running on 14.04. There are so many nice things in this environment (ObjC+Foundation+Blocks+ARC+DIspatch). It makes for a nice Linux development toolchain. I’m happy this has worked for you. Now the sad part – I’m moving my development to Swift. It’s just too cool of a language.